The Apple Watch has grown from a baby into a toddler, but is it ready to take off at any moment? To celebrate its first birthday later this month, mobile shopping site and app provider, Branding Brand tapped into 1,000 Apple consumers to see how the wearable is catching on. The survey found that 4% of consumers own an Apple Watch, 4% own another type of smartwatch, and 92% don’t own a smartwatch. Of the group that doesn’t own a smartwatch, 53% said nothing would convince them to buy an Apple Watch. Among the remaining 47% that is interested in buying one, the top concern was cost, followed by features, styles, battery life, and better apps. Cost was the top concern among 39% of consumers interested in buying the Apple Watch. As Apple announced in March, its Sport watch now costs $100 less, starting at $299. With a lower entry-level cost, Apple Watch is still more of an investment than its fitness-focused competitors like Fitbit and Samsung, with comparable devices starting at $199.95 (Fitbit Blaze) and $249.99 (Samsung Gear S2). Branding Brand’s survey found that 16% of those interested in buying an Apple Watch want improved features and functionality. 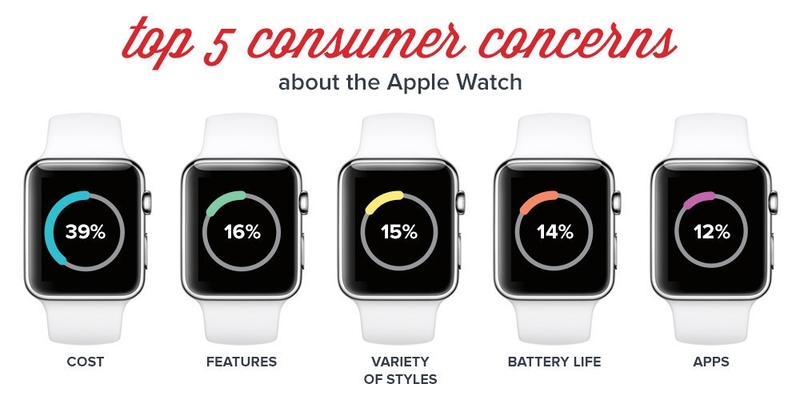 Apple Watch style variety matters to 15% of consumers interested in buying it. Along with a lower price announced in March,Tim Cook noted that people love changing the watch bands and about a third of wearers regularly change the bands. 14% of consumers surveyed care about battery life when it comes to buying an Apple Watch. However, rumors of elevated wireless power and FaceTime in the next Apple Watch might negate any upcoming battery improvements. Branding Brand found a correlation between people who own an Apple Watch and also shop online. Those who shop online weekly are two-times more likely to own an Apple Watch than those who shop online less often. ABOUT BRANDING BRAND: Branding Brand launches and optimizes web, app, and in-store shopping experiences for 200 major brands, including American Eagle Outfitters, Sephora, and Bath & Body Works. Over two billion customers a year shop on the Company’s patented platform, arming its analysts with the largest collection of data on usability best practices. For more information, visit brandingbrand.com, or follow @brandingbrand on Twitter.